Biden Suspects Military Burn Pits Caused Son’s Fatal Cancer | Sean Kendall that they were the cause of Beau’s fatal brain cancer. The following blog describes Beau’s exposure, explains why burn pits are so dangerous, and provides options for veterans who have been exposed. Beau, once a Major in the Delaware Army National Guard, served in both Iraq and Kosovo. In each location, he had extensive exposure to burn pits. Tragically, he died of brain cancer at age 46. While Biden admits that he does not have any evidence that his son’s exposure to burn pits caused his cancer, anyone with a basic understanding of burn pits would suspect that he is right. Burn pits, which have been used by the military throughout Iraq and Afghanistan to dispose of waste, are giant fires which consume everything from cars and uniforms to styrofoam and batteries. With jet fuel as an accelerant, the fires burn for hours on end, pluming large clouds of smoke which extend beyond the burn zone and cover the living quarters. In short, burn pits pollute the air servicemen and women breathe with some of the most toxic substances imaginable. 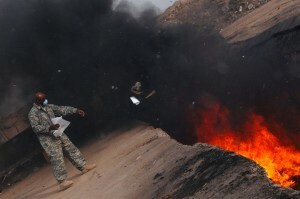 While it seems like it should be obvious, it is difficult to prove a connection between burn pits and illnesses such as brain cancer because is it is challenging to prove: 1) that a certain amount of carcinogens were in the air at any given time; and 2) that those particular carcinogens are the reason for a veteran's illness. The Department of Veteran’s Affairs has relished in this ambiguity. Despite the fact that over 100,000 veterans with burn-pit exposure have documented a range of illnesses, including rare cancers and neurological disorders, the VA maintains that the effects of exposure are temporary and resolve when the exposure ends. Therefore, the VA refuses to recognize burn-pit exposure as presumptive, and leaves it up to veterans to prove the connection between their exposure and their illnesses if they hope to receive disability benefits. However, proving that connection is not impossible, particularly with the help of an experienced veterans’ law attorney. If you are suffering from illnesses which you believe may be connected to burn-pit exposure, I encourage you to apply for disability benefits right away. If you receive a denial or an unacceptable rating decision from your Regional Office (“RO”), contact us by phone at (877) 629-1712 or online. With decades of combined experience cutting through the VA’s bias and overturning RO decisions, we are confident we can win you the benefits you deserve.